I laughed aloud at 30 Rock the other day when Jack remarked in passing that Liz wouldn’t have anything to offer society after a zombie apocalypse, because Jonathan and I had discussed that very issue the day before. From time to time my heart searches out reasons to despair. I don’t know why it occasionally feels comforting to revel in despair. David tells me it’s my superhero weakness and invests in me through encouragement at every turn. My wife usually makes me man up. But I’ve thought about what role I might play in society, post-zombie-apocalype. Try to picture the scenario: there are maybe a couple hundred or so humans left alive on earth, and they are beginning to rebuild society. You are among them and so am I. Let’s say these are average or above average people in terms of morality and intelligence. They generally want to work together and are willing to compromise, but there is a lot of work to do to rebuild. Maybe the wall keeping the remaining zombies out encircles some grocery stores, so there is food for now, but it won’t last. We need farmers. Maybe there are some usable buildings left, but a lot of demolition and construction have to be done. I consider hunting, gathering, farming, and construction-related activities “bottom-up”, but we need “top-down” people too: rulers. We need some people to help organize the construction efforts, the medical undertakings, what war effort may remain, etc. We need queen bees as well as worker bees. But where do you fit in? Where do I fit in? I’ve thought a lot about it. I’m not good at queen-beeing or worker-beeing. So would I just find a menial job I could just do? Would I try to get involved in the politics? What? The fact is that my interests and skills are just not very value-adding in post-zombie-apocalypse land. And frankly, I often have trouble seeing their value in reality-land. If all my hopes and dreams come true and I get to teach philosophy, perhaps someone will pay me to teach them. But for what? So they can turn around and teach someone else? Where does it end? Or rather, where does the value-adding occur? My work won’t help people eat, won’t be physically constructive, won’t clothe people, and won’t help organize and govern people. It feels like a pyramid scheme, except with less monetary benefit to myself. It’s a bankrupt, ivory tower scheme. We don’t seek understanding and creativity so that we can eat and build shelter. We eat and build shelter so that we can seek understanding and creativity. Fortunately for all involved, zombies don’t exist. I think Jon is a very wise man. Even after a zombie apocalypse, I think the ultimate point would be to share the Gospel to all that are left (even if a very few people could see that). Your skills would still be extremely valuable for that. Sure, eating is important, but keeping our eye on the eternal prize will still be more important than finding our next meal and building a temporal society here. I have given this scenario a lot of thought myself. I plan on using a Costco as the basis for the reconstruction of society, since it offers necessities for life, accouterments for culture, and a defensible fortress against zombies. It all comes down to Maslow (http://dinamehta.com/blog/wp-content/uploads/2007/10/800px-maslows_hierarchy_of_needssvg.png). 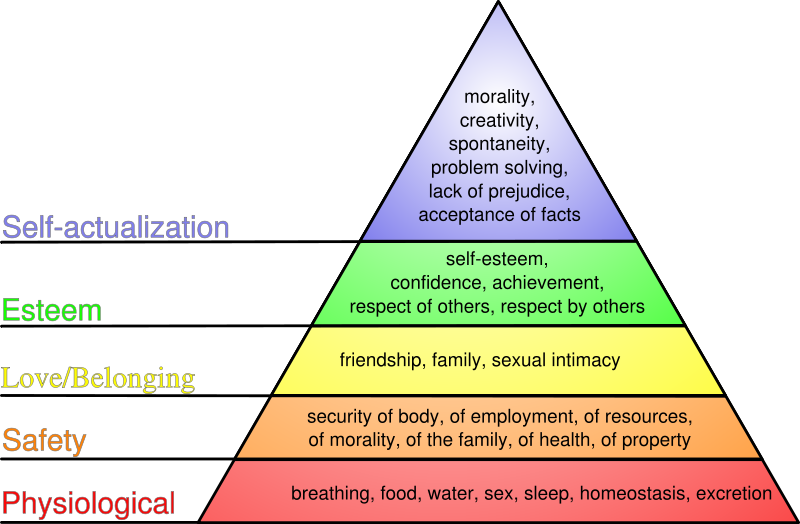 You might not be particularly skilled with those lower sections of the pyramid at present, but I’m sure you could putz around in the garden until humanity was secure enough to start getting self actualized. Then you would shine! Wow, this post and all of its comments are so cool. I second what David says about Jon. Now, when you said you discussed that very issue the day before with Johnathan, you meant the guy who’s in love Jack, right?